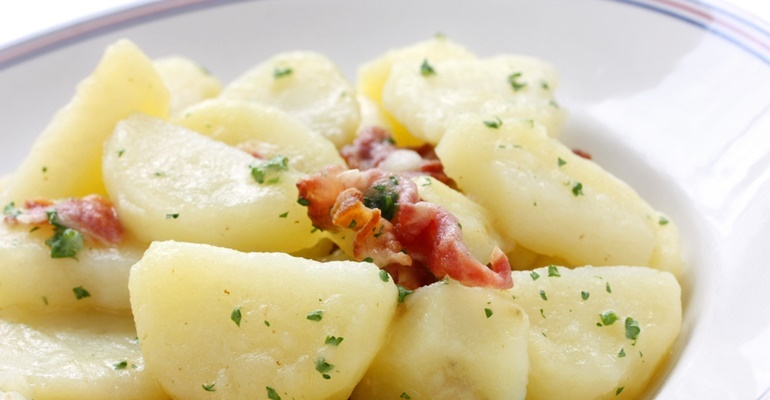 Here’s What You Should Do With Those Leftover Potatoes! When it comes to tasty salads I usually choose ones that have fruit and veggies that are in season. Sometimes I use ingredients from my own garden or from the local farmer’s markets or fruit stands. However, during the colder months of the year my garden is not an option, haha! And that’s when I also tend to start looking for salad recipes that are a little heartier; instead of fruit I go for potato salad. This potato salad recipe is something else. As soon as I came across it, I knew it would become a new family favorite! It combines ingredients like BACON and blue cheese. Yummy! Everyone loves bacon, right? My kids love to help me out when I’m making this salad. The recipe is super easy, so even my 3-year-old can participate! I have a tip for you; any time you’re boiling potatoes for your dinner, add some extra. That way you’ll have them ready for making this salad the next day! Quick Tip: This recipe makes up to 10 servings.